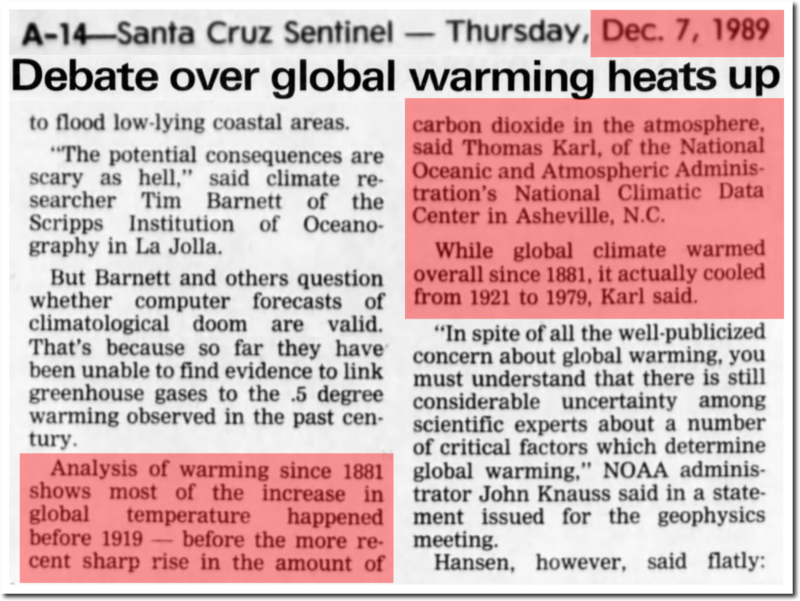 In 1989, the long time head of NOAA’s National Climatic Data Center reported most global warming occurred before 1919, and that Earth cooled from 1921 to 1979. The actual data wrecked global warming theory, so NASA and NOAA have been steadily rewriting the temperature record ever since – to match their broken theory. 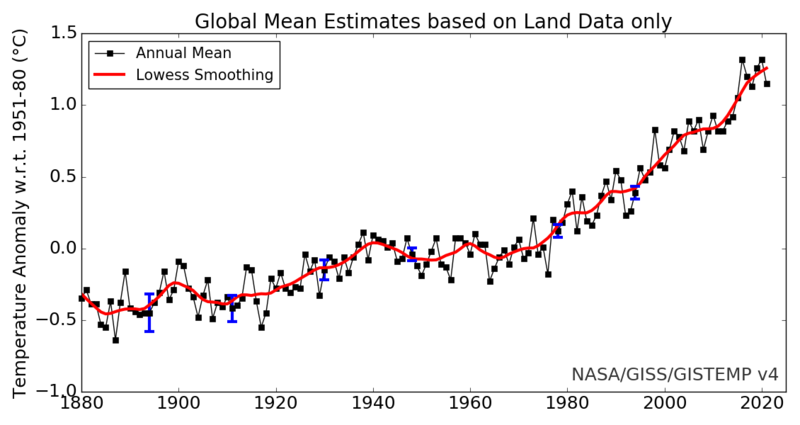 NASA now shows very little warming from 1881 to 1919, and lots of warming from 1921 to 1979. The exact opposite of what Tom Karl wrote in 1989. Well behaved skeptics are expected to accept the NASA temperature record, but I can’t think of any good reason to provide assistance to the biggest fraud in science history. Many of the very elderly (85+) I work with recall their childhoods as being quite warm with memorable droughts. Not exactly empirical but I think it’s worth something. My daughter comes home from Freshman Sociology class and they’re now telling college kids that Southern Democrats up until Lyndon Johnson were indeed racist bigots, but President Johnson bucked his Party and passed the Civil Rights Act and so all the Southerners got mad and switched to Republican, and that’s why Republicans are the racists and bigots today! I suppose it would be impolite to ask your daughter to ask her teacher what evidence there is to support this far-fetched idea and that just because they would like it to be true does not make it so. Certainly if this had been the case then more than just one or two congress-critters would have switched parties then. That should be pretty easy to show if it were true. I would expect either a deafening silence or more lies or very rapid tap-dancing. 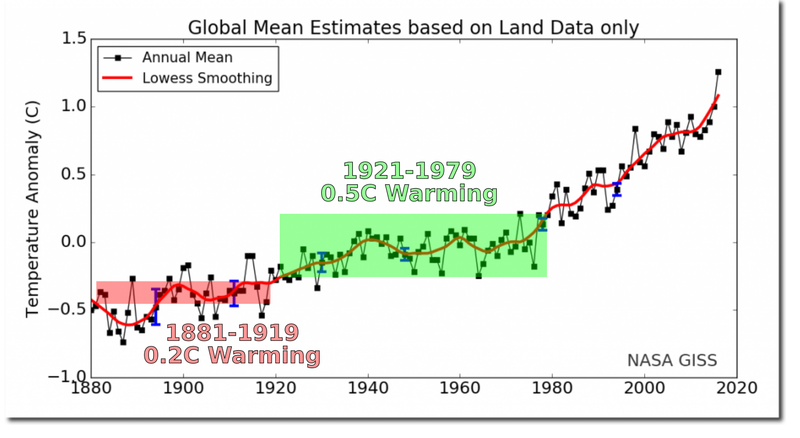 While the changes from the black to the blue and red graphs are a travesty, I am afraid that the 1981 black graph does not actually support Karl’s assertion that it was cooling from 1921 to 1979. It is interesting, though, that he is quoted as saying that. Was there some other dataset or graph to which he was referring, I wonder? 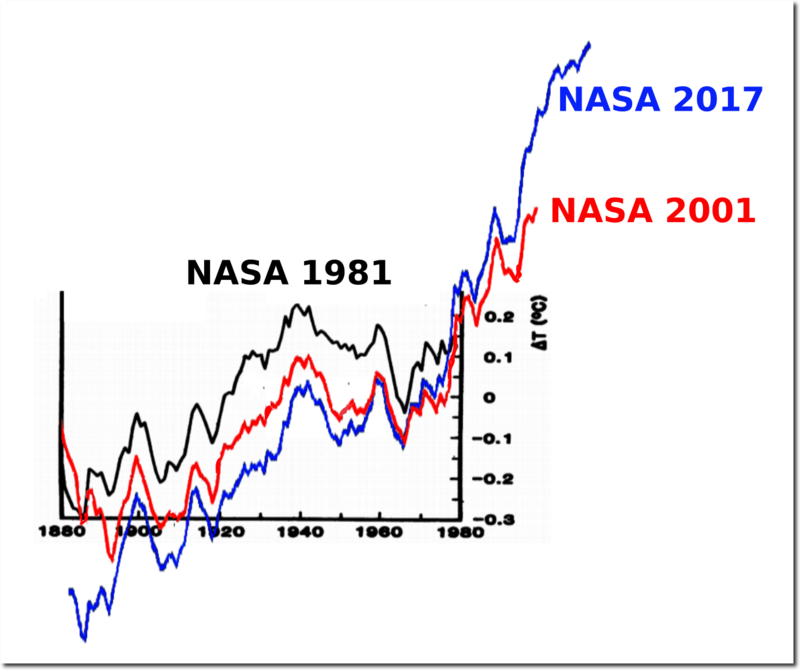 The 1981 graph is not from NOAA. It is from James Hansen who was fighting Tom Karl to get on board the scam. Note his name in the 1989 newspaper article. You seem to have missed the point of this blog post. Data is constantly being altered. EPA, NASA, PARIS AGREEMENT, AL GORE AND MOST ENVIRONMENTAL ORGANIZATIONS. Are all knowledge shortage poor! Only cheat money by donation! Or try keeping their easy high pay jobs positions longer! For about a century. Trillions Dollars been Wasted or in some people’s pocket. Do nothing no solution! Only some useless meaningless graphs data. Make graph can understand many things, but depend on locations. Not in office or your bedrooms. Differ place have differ readings. These reading will help you find out solutions. My goal are try to fix climate change, not donation. Simply flooded some dried lakes in or by deserts will fixed all global warming, global flooding, forest wildfires, earthquakes, climate change immediately! Please read all below articles, If understand you will know how easy to fixed all climate problems.